I bring your attention to a recent finding in England. 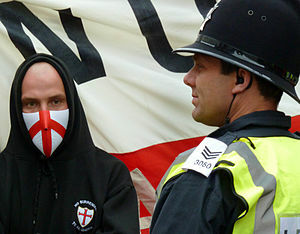 The far right as formed a large group called the English Defence League. Their mission statement states they are a human rights organization protecting British citizens against Sharia law, radical Islam, and the watering down of English culture. Their numbers appear small according to their website however, they seem to cause quite a stir where ever they protest. The lesson is simple. Extremists are abound in England. My opinion is that there are both Islamic extremists and far right groups such as EDL. I feel we should pay attention and pray for peace.